The route to digital transformation is to migrate a set of applications or workloads to an Infrastructure as a Service (IaaS) platform, aka “Lift and Shift”. Industry analysts estimate “Lift and Shift” will comprise a significant percentage of the initial migrations, with the remainder of the migrations focused on re-engineering applications to take advantage of cloud native or SaaS capabilities. 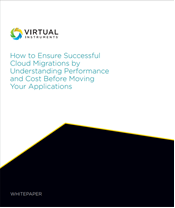 Submit the form to get the whitepaper and you'll discover how to de-risk the “Lift and Shift” migrations with the Virtual Instruments Cloud Migration Readiness (CMR) Service. © Virtual Instruments. All rights reserved.